The perfect addition for a themed event. A sound that can only be described as soothing yet energetic. This instrument is ideal for those of you that are hosting a themed event or would like to opt for something different for your drinks reception. Stand back and watch your guests tap their feet while our steel band (or steel pan group as some like to refer to it as) blissfully play to various genre's of music. they can play over or to anything from Soca, Calypso and Caribbean through to Samba, Rumba and Reggae. Notice how guests start to sing along to popular classics from artists such as Eddie Grant, UB40 and Bob Marley whilst they mingle during your event. The preferred events for this entertainment are usually drinks receptions, garden parties and themed events but recently have become popular within the corporate world and during wedding celebrations. Our Steel band comes in a 2 pieces, 4 piece and 6 piece but has room to increase these numbers for larger shows. 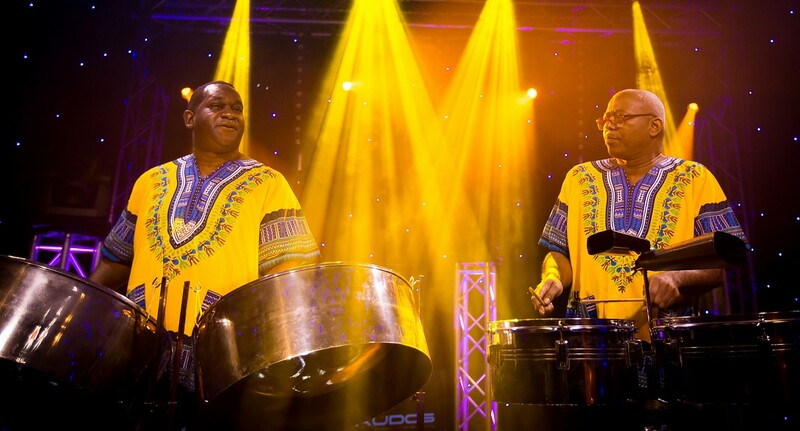 Why not book a Kudos Steel Band for your wedding or event today! Contact the sales team to see how we can find the perfect entertainment for you.